If you are using Google Music and have an iPhone, you now have a few app options for streaming your Google music on your iPhone. So far 2 unofficial iPhone apps have emerged and Google itself provides an iPhone optimized webapp for viewing and listening to your music from your iOS devices. Below we’ve reviewed the new Google Music apps available to help you discover and decide which route to take. Keep in mind that none of these solutions provide the ability to play your Google Music offline as of now. Also the 3rd party iPhone apps are not officially licensed by Google so they may be subject to changes at any time. gMusic is a new native app that lets you login using your Google account and listen to your Google Music library from your iPhone. Once you’ve logged in you are presented with the main app screen which contains 5 tabs on the bottom: Playlists, Artists, Songs, Albums, and Genres. In my case it took a few minutes before the playlists were populated into the gMusic app, but they did load. Browsing is pretty fast and responsive and you can search for anything by keyword. When navigating long lists you can drag on an alphabetical line (like in the native iPhone Contacts app) for quick navigation. Artist pages are shown with all their albums and available cover art, which you can dig further into. There is also an “All Songs” section for each artist which is useful. Once you start playing music, a “Now Playing” button appears on top of the app which you can use to get back to the playing screen. The Now Playing screen shows the album art along with pause/play/forward/back buttons on the bottom. You also have a seek bar on top of the screen which can be used to move around the playing track. Tap to enable shuffle, repeat. There is a menu for sending audio out to your Apple TV or Airport Express devices via AirPlay. gMusic supports iPod controls from the iPhone menu and background playback which is a good feature. Issues with gMusic: First and foremost, the app crashes and freezes here and there. The search functionality doesn’t quite work and just keeps you stuck with a keyboard in your face. If you start dragging the seek bar too far into a song, the song just jumps back to somewhere in the middle which is strange. Sometimes when one song ends the next song doesn’t automatically start to play. There is no way to create or manage a play queue. The app somehow keeps its own playback queue and sometimes you end up listening to previously chosen songs in the mix, even though you’ve picked a new artist. There is no way to edit track info, edit existing playlists, or create new ones. Finally there is no log out button provided. Most of these bugs maybe fixed in the next version of the app by the developer. Overall, gMusic is impressive with its fast load speed, friendly user layout, and responsive execution. It works over WiFi and 3G and if a few more features are added and the stability bugs are fixed, it can become an awesome little Google Music iPhone app. 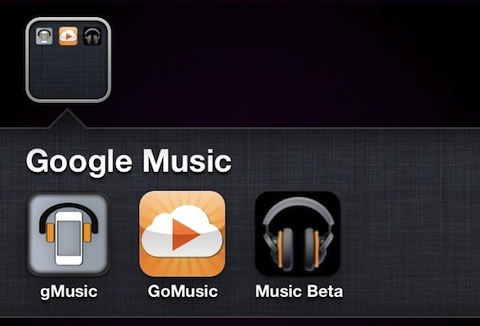 GoMusic is another unofficial Google Music app for the iPhone from Sokolware LLC. The GoMusic app has a slightly different user interface, which uses icons on a screen (like the Facebook app used to be) instead of tabs on the bottom of the screen. This makes going back and forth between various sections of the app cumbersome, since you have to go back all the way to the main screen to go into another area. The main icons are Artists, Albums, Songs, Playlists, and Logout. The presentation of the lists are also a bit different and don’t use the native iPhone controls. There is no search feature and there is no alphabet navigation control, so moving around in long lists can be tedious. If an artist has more than one album, GoMusic displays all the album cover art graphics on one line in the list view which is nice. Once you go into the artist page however, all the songs and albums are shown in one flat list separated by a title row for each album. The now playing screen allows you to pause/play/forward/back as normal and displays the cover artwork. Tap once to reveal the seek and volume controls, along with an AirPlay menu, and the time elapsed and time remaining counters. A now playing menu appears on the bottom of the app when you’re listening to music. This row includes an album icon, a song info marquee along with a visualizer graphic, and pause/FF buttons. Tapping anywhere on this bar takes you back to the now playing screen. 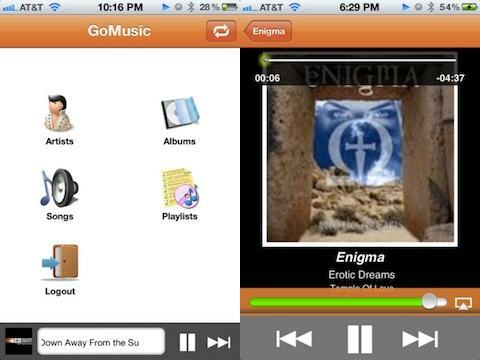 Background playback and iPod controls are supported in GoMusic. Using the seek bar to jump to various parts of a song works surprisingly well and without any issues in GoMusic. Issues with GoMusic: The app randomly crashes. The navigation is not very intuitive and can take some getting used to. There is no way to create or manage a playback queue. There is also no information about the number of songs in a queue when you are on the Now Playing page. Although you can create a new playlist by giving it a name, it’s not clear or possible to actually add songs to that playlist from the app. You can however slide left to remove existing songs from a playlist. Finally the overall graphics design in the app feel slightly outdated and could use some polishing up. Overall, GoMusic is actually a great unofficial Google Music player, if you can live with the random crashes and the unfamiliar user interface. Hopefully the developer is working on adding some design upgrades and stability fixes to the app in the coming weeks. For a web based application, the Google folks have done a pretty remarkable job creating a web based interface to Google Music. The first time you load the page (music.google.com on your iPhone), you’ll be asked to allow Google music to use 25MB of storage on your iPhone by increasing the database. 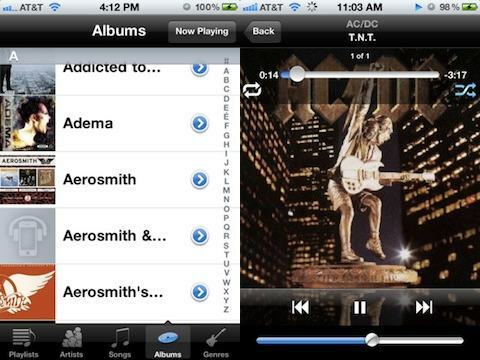 There are sliding navigation tabs across the top for switching between Artists, Albums, Songs, Playlists, and Genres. The Now Playing screen has a seek bar, shuffle, repeat, pause, play, next, previous and album artwork support. Besides the obvious limitation of performance and speed, and of lag and unresponsiveness in a web app, you can’t really manage anything from the iOS web interface of this webapp. Meaning you can’t add tracks, delete tracks from playlists, or create new playlists. For more details on this web app read our full review of the Google Music iPhone webapp. AppSafari review of iPhone apps for Google Music was written by Joe Seifi on October 27th, 2011 and categorized under App List, Music. Page viewed 5580 times, 2 so far today. Need help on using these apps? Please read the Help Page.